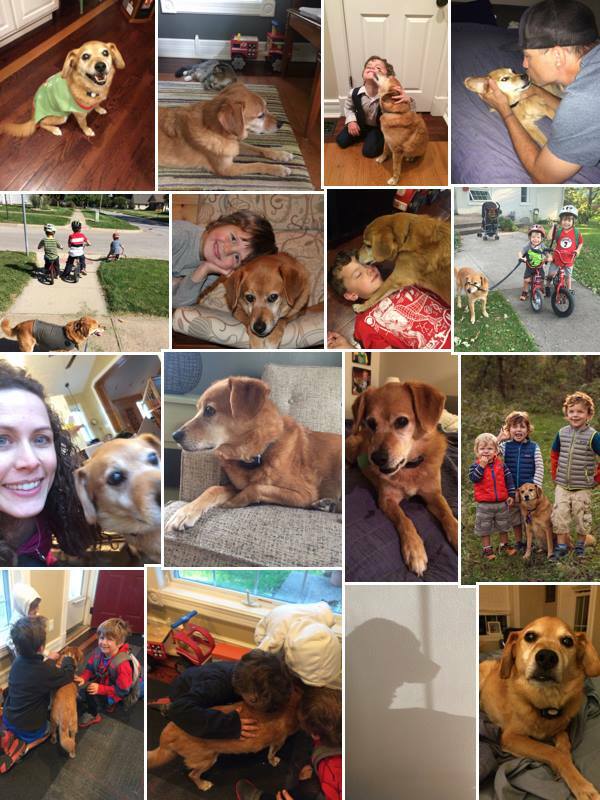 My dog is dying and I’m devastated to say goodbye. As a veterinarian, I face death on a daily basis. I watch (and cry) as person after person weeps as they say final goodbyes, having often made the heroic choice to end the pain and suffering of his or her very best friend. Today, as I face this decision, I am reminded of what courage that takes. I am also reflecting on why it hurts so much. I feel, 100%, that it is a gift to prevent on-going suffering in a terminal disease. And, obviously, we know that it hurts because of the love we have. But for me, this time, my dog isn’t one that has been “the best dog” or “that one”. I’ve been there before and I think of my cat AJ (“the one”) each and every day since losing her over 6 years ago. Holden is a “special” dog. He is naughty, annoying and generally would run away from me at any given point in search of something more exciting. It’s been an interesting 14 years together for sure! Though he can barely walk now, he climbed all the way up on the table to eat leftovers off a plate not even a week ago. Until this morning, I have never been able to stop him from getting in the dishwasher to lick the plates and silverware. He has destroyed every “indestructible” dog toy on the market and only in the last few years have we found a way to keep him out of the garbage (magnetic child lock FYI). He even developed the great “party trick” of running off to pee on our bed if he heard a phone ring, ding or even buzz. This, despite behavioral modification, medication AND SEDATION!!! But, as I was sobbing at the thought of losing him today, I came to realize what makes losing him- this “not the one” dog- so very very hard for me. He has been the one source of pure positive reinforcement for me, personally, as I have gone through the ups and downs and wear and tear of all the years we have been together. He hasn’t behaved well (for sure! ), but he has ALWAYS given ME positive reinforcement…and I needed it! I survived vet school, moves, a new job, becoming a mom (x3), buying and operating a business, all-the-while nurturing (surviving!) a marriage with someone going through the same chaos. How many spouses, kids, friends or family meet you EACH AND EVERY DAY with a tail wag and lick (who cares that he just wanted food!!?) when you walk through the door? He gave me positive feedback on the good days and on the bad and I gotta tell you, that can keep an exhausted woman alive. Holden has been more than that, of course. He will always be the first dog my boys have had and the first dog my husband and I have had together. He has taught me MANY lessons as a veterinarian that I will use for years to come. In my opinion, he would definitely win any contest to lick a face the longest, especially enjoyable (NOT) when he would have recently visited the cat box (having broken through a baby gate to get there!) or was due for a dental cleaning! He will teach my boys the lesson of death and dying, grief and remembrance. When I hear a phone ding or buzz, you can bet I will always think of him just as those who have had dogs with storm anxiety never hear a rumble without thinking of their own dog. We will all be laughing and crying A LOT over the next few days, weeks and years as we remember Holden. And that… is good. When I think of the gift of working in the veterinary field it will always be the human-animal bond that I am most grateful for. It displays itself in innumerable ways and I will continue to work each day to help preserve that for my family and for others.